Temkin Group’s research shows that companies evolve through six stages of CX maturity, but the higher levels of maturity take a significant jump in focus and commitment. What does that path look like? Take a look at this infographic. People always ask about the connection between customer experience and business results. Well, here’s some visual evidence of the linkage. 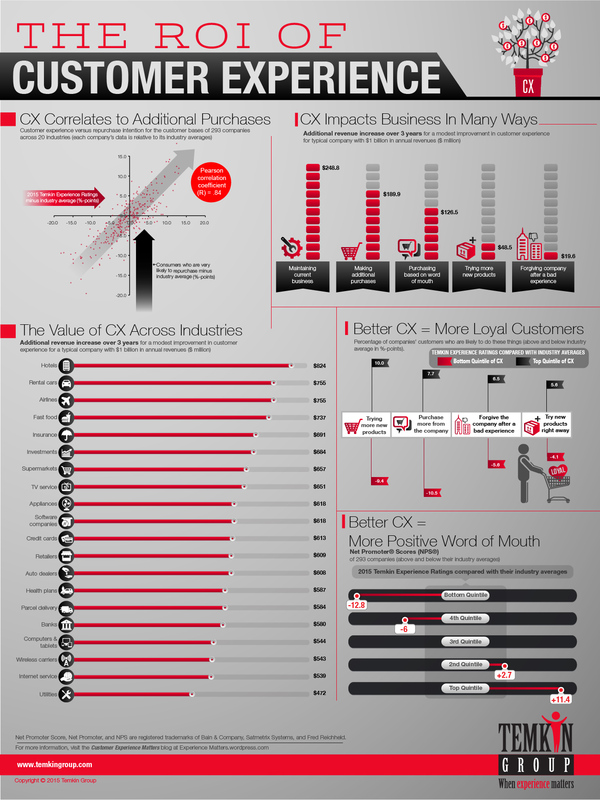 In this infographic, we share data from the Temkin Group research report, ROI of Customer Experience 2015. We recently published the Temkin Loyalty Index (TLi), which examines five areas of loyalty for 293 companies. So I looked at how that data related to the Temkin Experience Ratings (TxR) for those same companies. To normalize the data across industries, we compared company scores to the averages for their industries. As you can see below, there’s a very high correlation between the two. For most companies, their CX is fairly predictive of their loyalty. But this connection is not equally strong for all companies. We took a look at the outliers, the companies that have loyalty levels that are much stronger or much weaker than their CX would suggest. Brand halo: Sometimes consumers’ view of a brand is stronger or weaker than would be supported by their experiences with the company. For some reason, there are emotional drivers that make consumers love or hate the company. Loyalty latency. When consumers have an experience that is not reflective of their expectations for a company, they often treat it as an exception. So it can take time for consumers to recognize that a company’s CX has improved or declined, and to adjust their loyalty accordingly. Switching costs. The harder it is for a consumer to move from one provider to another, the less effect bad CX will have on loyalty. Perceived alternatives. The fewer direct replacements that a consumer thinks he/she has for a company’s product or service, the less effect bad CX will have on loyalty. 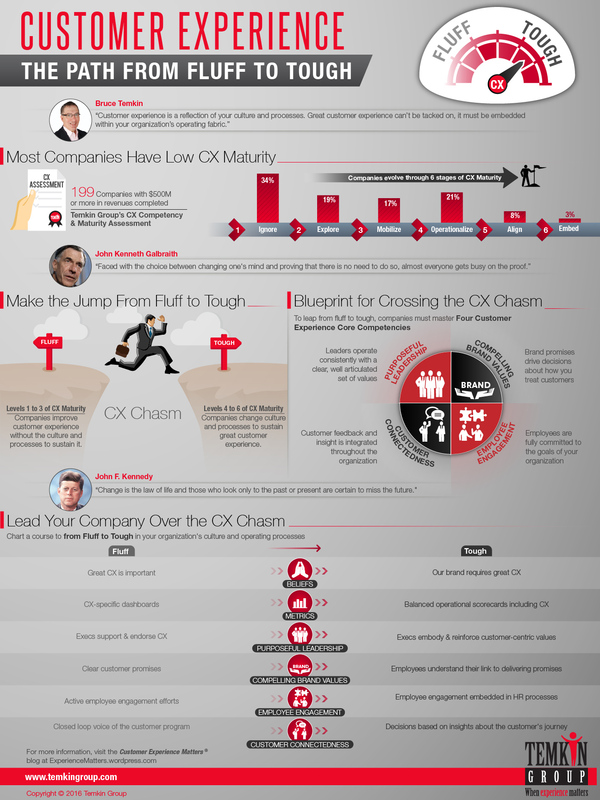 Once again, Temkin Group is publishing a new infographic for CX Day. CX Day is less than one week away! As part of Temkin Group’s CX Day celebration, we created a new video, Customer Experience Matters® . It shows the value and power of customer experience. Share it, share it, share it! In honor of Customer Experience Day, Temkin Group created its second annual “The State of Customer Experience” infographic. Here’s a link to last year’s infographic. The bottom line: Happy Customer Experience Day! To understand how customer experience corresponds to loyalty, we examined feedback from 10,000 U.S. consumers describing their experiences with and their loyalty to 268 companies. Our analysis shows a strong correlation between customer experience and loyalty factors such as repurchasing, trying new offerings, forgiving mistakes, and recommending the company to friends and colleagues. We compared the consumers who gave companies a very good customer experience rating to those who gave companies a very bad customer experience rating, and we found that the percentage of customers who plan on repurchasing products is 18 percentage-points higher at organizations with excellent CX ratings. Additionally, the Net Promoter Scores of companies with very good CX ratings average 22 points higher than the scores of companies with poor CX. We built a model to evaluate how customer experience impacts a $1 billion business’s revenue over three years in each of the 19 industries, and this model shows that CX has the largest impact on hotels ($461 million), fast food chains ($437 million), and retailers ($428 million). This report also includes a five-step approach for building a model that estimates the value of CX for your organization. The report has 29 charts, which includes specific details on the connection between customer experience, loyalty, and increased revenues for each of the 19 industries in the study: airlines, appliance makers, auto dealers, banks, car rental agencies, computer makers, credit card issuers, fast food chains, grocery chains, health plans, hotel chains, insurance carriers, Internet service providers, investment firms, parcel delivery services, retailers, software firms, TV service providers, and wireless carriers. The bottom line: Customer experience is highly correlated with loyalty. Nobody owns it (or the corollary, everybody owns it). In the early stages of the quality movement, companies put in place quality officers. Many of these execs failed because they were held accountable for quality metrics and, therefore, tried to push quality improvements across the company. The successful execs saw their role more as change facilitators — engaging the entire company in the quality movement. Today’s chief customer officers need to see transformation as their primary objective — and not take personal ownership for improvement in metrics like satisfaction and NetPromoter. It requires cultural change. Many US companies in the 1980’s put quality circles in place to replicate what they saw happening in Japan. But the culture in many firms was dramatically different than within Japanese firms. So companies did not get much from these efforts, because they didn’t have the ingrained mechanisms for taking action based on recommendations from the quality circles. Discrete efforts need to be part of a larger, longer-term process for engraining the principles of good customer experience in the DNA of the company. It requires process change. Quality efforts of the 1980’s grew into the process reengineering fad of the 1990’s. As business guru and author Michael Hammer showcased in his 1994 book Reengineering the Corporation: A Manifesto for Business Revolution, large-scale improvements within a company requires a change to its processes. That perspective remains as valid today as it was back then. Customer experience efforts, therefore, need to incorporate process reengineering techniques. That’s why these efforts must be directly connected to any Six Sigma or process change initiatives within the company. It requires discipline. Ad-hoc approaches can solve isolated problems, but systemic change requires a much more disciplined approach. That’s why the quality movement created tools and techniques — many of which are still used in corporate Six Sigma efforts. These new approaches were necessary to establish effective, repeatable, and scalable methods. A key portion of the effort was around training employees on how to use these new techniques. Customer experience efforts will also require training around new techniques. Here are a few posts that describe this type of discipline: Four Customer Experience Core Competencies, Customer Journey Mapping, and The Six Ds of a closed-loop VoC Program. Upstream issues cause downstream problems. This is a key understanding. The place where a problem is identified (a defective product, or a bad experience) is often not the place where systemic solutions need to occur. For instance, a problem with a computer may be caused by a faulty battery supplier and not the PC manufacturer. A bad experience at an airline ticket counter may be caused by ticketing business rules and not by the agent. So improvements need to encompass more than just front-line employees and customer-facing processes. Attacking upstream issues is part of moving from fluff to tough in your CX efforts. Employees are a key asset in the battle. The quality movement recognized that people involved with a process had a unique perspective for spotting problems and identifying potential solutions. So the many of the tools and techniques created during the quality movement tap into this important asset: Employees. Customer experience efforts need to systematically incorporate what front-line employees know about customer behavior, preferences, and problems as well as what other people in the organization know about processes that they are involved with. That’s why we’ve assembled a page of employee engagement resources. Executive involvement is essential. For all of the items listed above, improvements (in quality then and in customer experience now) require a concerted effort by the senior executive team. It can not be a secondary item on the list of priorities. Change is not easy. To ensure the corporate resolve and commitment to make the required changes, customer experience efforts need to be one of the company’s top efforts. Senior executives can’t just be “supportive,” they need to be truly committed to and involved with the effort. It may help to share our Executive’s Guide to Customer Experience with your leaders. You can do it too. All you have to do is take the time to understand the concepts, teach them to others, and keep the pressure on. The bottom line: The great customer experience is free movement is underway. Join me! I’ll start with the takeaway: Better customer experience leads to more forgiving customers, more trusting customers, and higher Net Promoter Scores (and a myriad of other good things that we did not include in this post). The 2013 Temkin Experience Ratings benchmarked the customer experience of 246 companies across 19 industries based on a survey of 10,000 U.S. consumers. But how does a good score relate to other measures of loyalty? I took a look at that question by examining how companies fared compared with their peers in other Temkin Ratings. We’ve done a number of studies of the IT industry, including Tech Vendors: Benchmarking Product and Relationship Satisfaction of IT Clients, 2013, 2013 Temkin Experience Ratings of Tech Vendors, and Tech Vendor NPS Benchmark, 2013. I examined data across these studies to analyze how being easy to work with affects loyalty. I analyzed feedback from more than 800 IT professionals who collectively provided more than 9,000 pieces of feedback on tech vendors. As you can see in the figure below, IT buyers are more loyal when tech vendors are easy to work with. Across all three measures, there’s a clear uptick in loyalty between a “4” and “5” on the easiness scale and loyalty continues to increase with every increased level of easiness. The percent of IT buyers who plan to spend more with tech vendors ranges from 4% for the vendors that are most difficult to work with to 55% of tech vendors that are easiest to work with (almost 14x). The percent of IT buyers who are willing to try a new product or service from a tech vendors ranges from 7% for the vendors that are most difficult to work with to 70% of tech vendors that are easiest to work with (10x). Net Promoter Scores from IT decision makers range from -72 for the vendors that are most difficult to work with to +79 of tech vendors that are easiest to work with (NPS gap of 151). Net Promoter Score (NPS) is a popular metric, but how does it relate to loyalty? We analyzed responses from thousands of consumers and examined the connection between NPS and three areas of loyalty: likelihood to repurchase, likelihood to forgive, and the actual number of times they recommend a company. Compared to detractors, promoters are almost six times as likely to forgive, are more than five times as likely to repurchase, and are more than twice as likely as detractors to actually recommend a company. Examining the data, we also found that consumers who gave a score between 0 and 4 have particularly low levels of loyalty. The analysis examines 19 industries: airlines, appliance makers, auto dealers, banks, car rental agencies, computer makers, credit card issuers, fast food chains, grocery chains, health plans, hotel chains, insurance carriers, Internet service providers, investment firms, parcel delivery services, retailers, software firms, TV service providers, and wireless carriers. Promoters who are likely to repurchase range from 87% for grocery chains to 73% for TV service providers, those who are likely to forgive range from 72% for rental car agencies to 59% for TV service providers, and those who actually recommended a company range from 80% for retailers to 47% for parcel delivery services. Here’s the first figure from the report. It has a total of 43 figures that include specific graphics for each of the 19 industries in the study. Promoters are almost six times as likely to forgive. We asked consumers about their likelihood to forgive a company if it delivered a bad experience and found that 64% of promoters are likely to forgive compared with 11% of detractors. Promoters are more than five times as likely to repurchase. We asked consumers about their likelihood to make additional purchases from a company and found that 81% of promoters are likely to repurchase compared with 16% of detractors. Promoters are more than twice as likely as detractors to actually recommend. In a separate study of 5,000 U.S. consumers, we asked consumers how many times they actually recommended each company. It turns out that 64% of promoters have recommended the company compared with 24% of detractors. Super detractors are much less loyal. Forgiveness and repurchase loyalty stay at a consistent low level between 0 and 4 on the scale. Actual recommendations begin to increase after 5. Midpoint attracts low recommenders. When we examine the actual quantity of recommendations across the NPS scale it turns out that there’s significant drop in recommendations at the midpoint of the scale, when 5 is selected. Download report for $295 (includes Excel dataset) The Excel file provides all of the data from the 43 figures. Note: See our report, Net Promoter Score Benchmark Study, 2012 and the post 9 Recommendations For Net Promoter Score along with all of my other resources for NPS programs. The bottom line: Promoters are more loyal than detractors. Report: What Happens After A Good or Bad Experience? We asked 5,000 U.S. consumers about their experiences with 179 companies across 19 industries. More than 60% who had a bad experience with a fast food chain, credit card issuer, rental car agency, or hotel cut back on their spending, and many stopped completely. But service recovery helps. For every level of improvement in how they responded to a bad experience, companies were rewarded with more sales. Unfortunately, firms aren’t very good at service recovery, especially banks and credit card issuers. TV service providers delivered the greatest number of bad experiences while grocery chains had the fewest. At a company level, ING Direct and Holiday Inn had the lowest number of bad experiences, while QVC and Best Buy had the highest. We also examined how consumers share their good and bad experiences, across age groups and income levels, and compared results from last year. This analysis uncovered a negative bias in how consumers give feedback. Motel 6, ING Direct, Albertsons, and RadioShack have the most negative bias in the feedback they get directly from customers; Cox Communications and Symantec have the most negative bias in feedback on Facebook; and Verizon and GE face the most negative bias on Twitter. The report has 20 graphics full of data on consumer behavior and company ratings. It starts by looking at the prevalence of bad experiences. It turns out that 20% of consumers have had a bad experience with a TV service provider while only 5% have had a bad experience with a grocery store. One of the streams of analysis looks at how consumers give feedback. As you can see, companies are more likely to hear about bad experiences than good experiences. ING Direct (2%), Holiday Inn Express (2%) Whole Foods (3%) and Holiday Inn (3%) had the fewest occurrences of bad experience, while Best Buy (29%), QVC (29%), Gap (28%), and eBay (26%) had the most. After a bad experience consumers were most likely to completely stop spending with rental car agencies (40%), credit card issuers (39%), computer makers (35%), and auto dealers (35%), but least likely to stop spending with retailers (9%) and Internet service providers (10%). When companies responded very poorly after a bad experience, 47% of consumers stopped spending completely with the company. When they had a very good response, only 6% stopped spending and 37% increased their spending. Retailers (46%) most often recovered well from a bad experience while Internet service providers (15%) and health plans (15%) were the worst at recovering. 38% of consumers gave feedback directly to the company after a very bad experience, but only 31% gave feedback after a very good experience. 14% of consumers gave feedback on a rating site like Yelp after both a very good or a very bad experience. The use of twitter to communicate about a very bad experience has grown from 4% to 9% of consumers over the last year. 33% of 18- to 24-year-olds have posted about a good experience on Facebook, compared with only 5% of those who are 65 and older. 18% of 18- to 24-year-olds have tweeted about a good experience, compared with only about 1% of those who are 55 and older. 17% of consumers who earn $100K or more have tweeted about a bad experience, compared with only 7% of those who earn less than $50K. Given their customer demographics, Motel 6, ING Direct, Albertsons, and RadioShack are the most likely to receive direct customer feedback that is negatively biased while Cablevision, Avis, Nissan dealers, and Dodge dealers are the most likely to receive positively biased feedback. Given their customer demographics, Cox Communications, Symantec, ING Direct, and TracFone are the most likely to have negatively biased comments on Facebook, while Cablevision, AOL, Kaiser Permanente, and Holiday Inn are the most likely to have positively biased comments. Given their customer demographics, Verizon and GE are the most likely to have negatively biased comments on Twitter, while Avis and Edward Jones are most likely to have positively biased tweets. The bottom line: Customer feedback is an under utilized asset.